You’re on the up as a business and the only way to accommodate more growth is to physically expand and move into your own permanent address. There’s just one niggling thing – where do you begin with an office fit-out? Thankfully, the experts at Spectrum Interiors have a few tips to make an empty office space the new home for your brand. Gather together the most experienced staff and compile a list of things you like about your current office and another list of opportunities to improve the space in its next incarnation. Also, remember to include newer staff (a companywide email will do), they may have a fresh perspective and bring over ideas from their previous workplaces. You could time the opening of the new office with a complete rebrand, or incorporate your time-tested branding into the new office. If you are established and happy that the current company colours, logos and literature represent you well as a company, find ways to reflect this in the office. Professional help here counts for a lot as it is a skill to balance many palettes, logos, murals, carpets and other options that tie together the cohesive feel of company headquarters. Although very important, your employees are not the sole focus of the office. It must serve your clients, too, if they are to visit. Imagine how they might interact with this new space – how can you make them instantly feel at home with your brand? You’ve outgrown a space before and you’ll outgrow it again. Of course, you want to maximise time spent in one location for economy’s sake. So, go into this new fit-out with a plan to easily adapt it to incorporate more desks, staff, departments or services in the future. Modern businesses with a digital emphasis should embrace flexible office spaces with little rigid structure. Desks can give the impression of solidity but should be easy to move around the space. So, too, should the break out areas for impromptu meetings, the waiting area and meeting rooms should be highly flexible and able to accommodate a range of seating plans. For example, you may want a boardroom seating plan in the morning, a lecture theatre in the afternoon and a brace of workshopping stations for the evening. Flexibility is key. For an example of flexible office spaces, see our Aria PC office fit out. The open plan office, meeting rooms and informal discussion areas provided an instant boost to productivity. 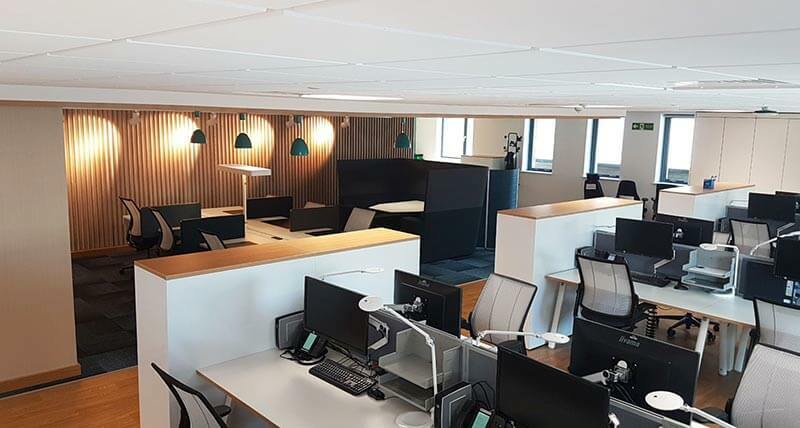 Another project at Doc Fictoria in Caernarfon, undertaken on behalf of the Welsh Government, allowed us to restructure working practices by creating a completely new office space. 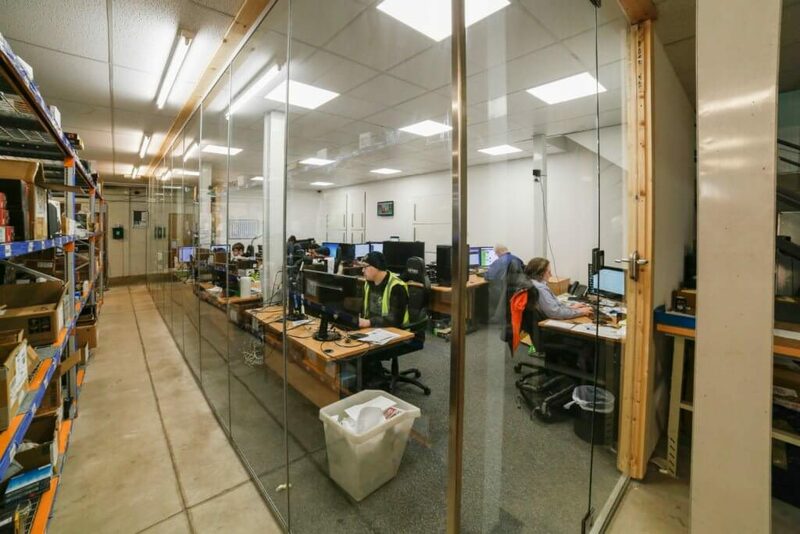 We took an empty concrete shell and offered flooring, ceilings, fittings, desks, partitions, break out areas, kitchenettes – and much more – to bring them into a productive new era. Spectrum Interiors transform commercial spaces with professional office fit-outs, washroom refurbishments, reception room renovations, shower facilities installation and many more services nationwide. For many years, we’ve helped the commercial, leisure, medical and education sectors to thrive with interiors to be proud of. To start the journey to a beautiful and functional new office space, contact us today via our contact form or call us on 08000306041.